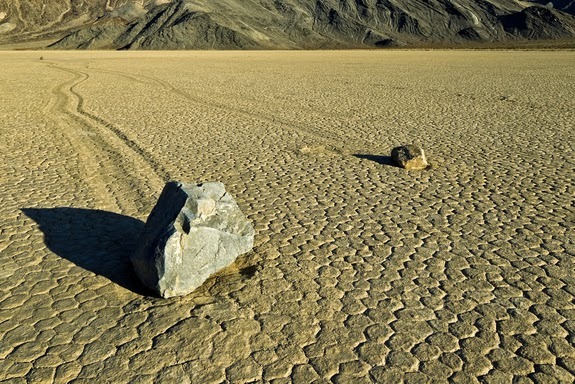 Racetrack Playa, a seemingly barren three mile long stretch in California’s Death Valley, and its famously mysterious sailing stones have long captured the interest of both scientists and geology enthusiasts, who have attempted to explain the phenomenon since the 1940’s. Theories explaining the long tracks following each rock ranged from alien interference to magnetic forces. However, because no one had actually seen the stones moving, it was almost impossible to determine the true cause of the moving stones. For many years, the prevailing theory was that the rocks somehow slid across ice, but this was never actually proven to be true. In 2006, planetary scientist Ralph Lorenz attempted to explain the sailing stones using the weather stations he set up in Death Valley. Lorenz studied the movement of the rocks, while comparing the phenomenon to other environments in which stones moves in a similar way, specifically the arctic tidal areas. He then created a simple model for his findings, based on an easy kitchen experiment that you can recreate using the instructions below. In 2013, a team of scientists verified Lorenz’s work by using GPS technology to track the movements of stones placed on the dry lakebed. Using time lapse photography, the team was able to capture one of the first videos of the moving stones, which you can watch here. It was determined that ice and wind helped propel the rocks across the Racetrack Playa. Small jagged pieces of ice provide a slippery surface for the stones to hydroplane across as the wind pushes them. You can recreate the easy experiment Ralph Lorenz used to test his theory at home. Find a small rock and place it into a small tupperware container. Fill the container with ice until only a little bit of the rock is sticking out. Freeze the container until the ice is solid and take the ice out of the container. Take a bigger bowl and coat the bottom with sand, then fill the rest with water. Place the rock and ice into the bowl upside down and gently blow. The rock should move and create small tracks in the sand. DEATH VALLEY NATIONAL PARK, Calif. (AP) — In 2006 scientists have theorized about how large rocks — some weighing hundreds of pounds — zigzag across Racetrack Playa in Death Valley National Park, leaving long trails etched in the earth. Now two researchers at the Scrips Institution of Oceanography have photographed these "sailing rocks" being blown by light winds across the former lake bed.